I have fond memories of this one… during my travels, I had kept up an email correspondence with Ann Stein, a teacher at Welty Middle School in New Philadelphia, Ohio. 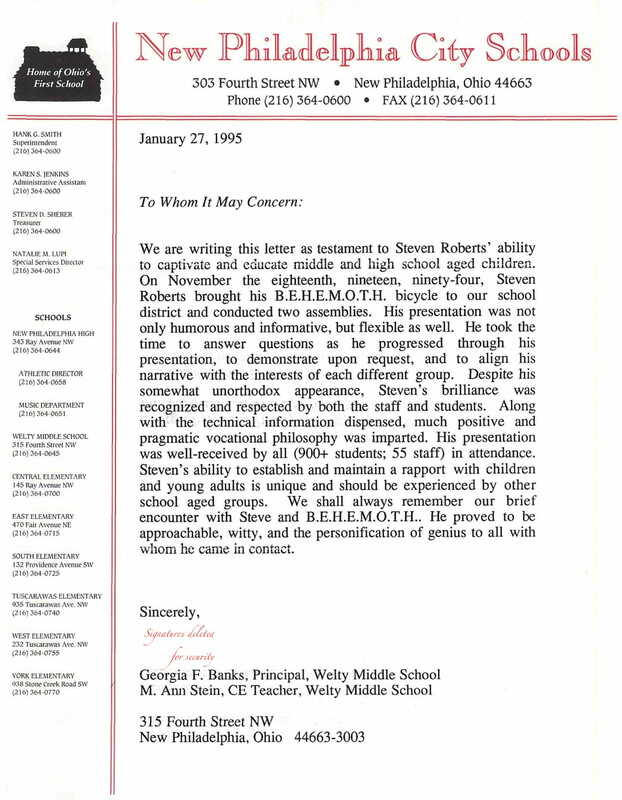 She had passed along questions from students and I had sent notes from the road, so when my 1994 speaking tour took me within range of her town, we set up a visit to the school. 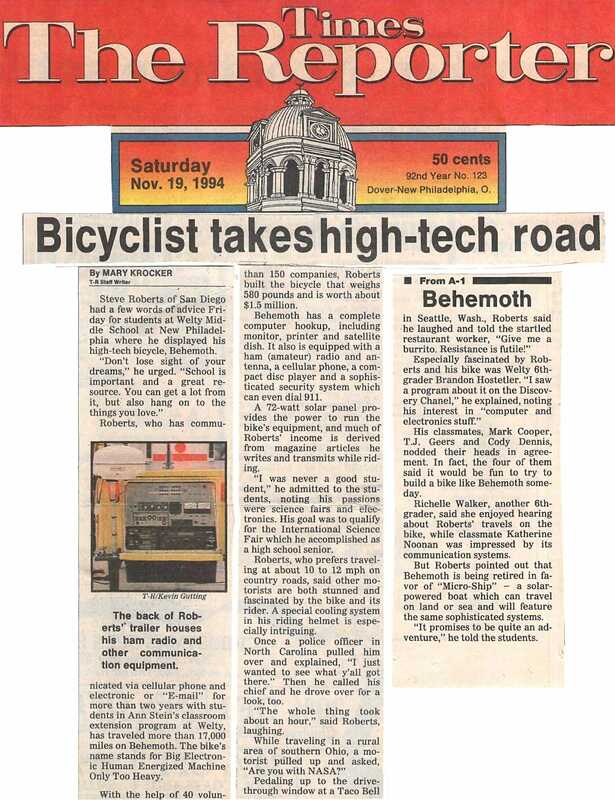 It was an enthusiastic gathering, with the kids excited about mobile computing and adventure, and the local paper sent a reporter to cover the event. Ann was kind enough to send a letter of recommendation for future such events, and it is included here as well (signatures deleted for security). Steve Roberts of San Diego had a few words of advice Friday for students at Welty Middle School at New Philadelphia where he displayed his high-tech bicycle, Behemoth. Roberts, who has communicated via cellular phone and electronic or “E-mail” for more than two years with students in Ann Stein’s classroom extension program at Welty, has traveled more than 17,000 miles on Behemoth. The bike’s name stands for Big Electronic Human Energized Machine Only Too Heavy. With the help of 40 volunteers and donations from more than 150 companies, Roberts built the bicycle that weighs 580 pounds and is worth about $1.5 million. Behemoth has a complete computer hookup, including monitor, printer and satellite dish. It also is equipped with a ham (amateur) radio and antenna, a cellular phone, a compact disc player and a sophisticated security system which can even dial 911. A 72-watt solar panel provides the power to run the bike’s equipment, and much of Roberts’ income is derived from magazine articles he writes and transmits while riding. 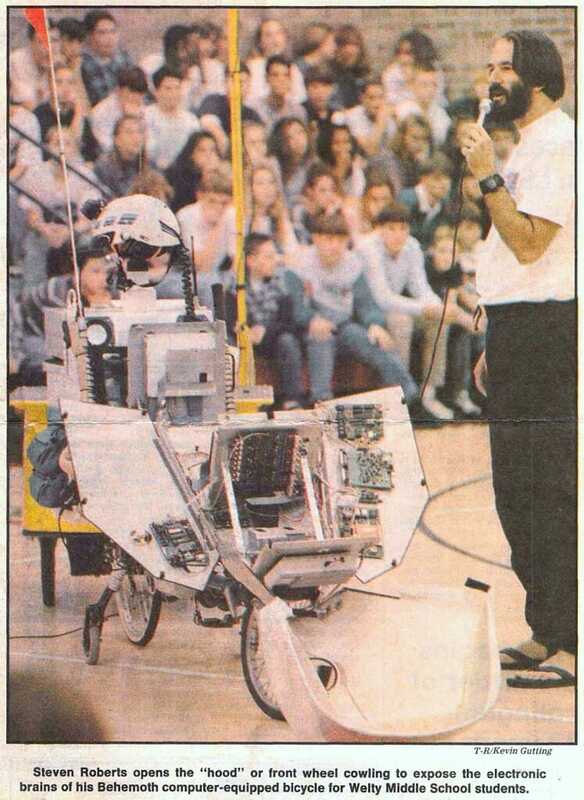 “I was never a good student,” he admitted to the students, noting his passions were science fairs and electronics. His goal was to qualify for the International Science Fair which he accomplished as a high school senior. Roberts, who prefers traveling at about 10 to 12 mph on country roads, said other motorists are both stunned and fascinated by the bike and its rider. A special cooling system in his riding helmet is especially intriguing. Once a police officer in North Carolina pulled him over and explained, “I just wanted to see what y’all got there.” Then he called his chief and he drove over for a look, too. “The whole thing took about an hour,” said Roberts, laughing. His classmates, Mark Cooper, T.J. Geers and Cody Dennis, nodded their heads in agreement. In fact, the four of them said it would be fun to try to build a bike like Behemoth someday. Richelle Walker, another 6th-grader, said she enjoyed hearing about Roberts’ travels on the bike, while classmate Katherine Noonan was impressed by its communication systems. But Roberts pointed out that Behemoth is being retired in favor of “Micro-Ship” – a solar- powered boat which can travel on land or sea and will feature the same sophisticated systems. “It promises to be quite an adventure,” he told the students. We are writing this letter as testament to Steven Roberts’ ability to captivate and educate middle and high school aged children. On November the eighteenth, nineteen, ninety-four, Steven Roberts brought his B.E.H.E.M.O.T.H. bicycle to our school district and conducted two assemblies. His presentation was not only humorous and informative, but flexible as well. He took the time to answer questions as he progressed through his presentation, to demonstrate upon request, and to align his narrative with the interests of each different group. Despite his somewhat unorthodox appearance, Steven’s brilliance was recognized and respected by both the staff and students. Along with the technical information dispensed, much positive and pragmatic vocational philosophy was imparted. His presentation was well-received by all (900+ students; 55 staff) in attendance. Steven’s ability to establish and maintain a rapport with children and young adults is unique and should be experienced by other school aged groups. We shall always remember our brief encounter with Steve and B.E.H.E.M.O.T.H.. He proved to be approachable, witty, and the personification of genius to all with whom he came in contact.